Trans supermodel Andreja Pejic has made history again by being the first trans woman to be featured on the cover of two Portuguese editions of the men’s magazine GQ. This is not just the first time this has happened in Portugal but worldwide. Thanks to Jan Brown for the tip. Check out both covers in the GayStarNews website. The state of North Carolina has replaced HB2 with a new law. The new law does not please those who saw HB2 as a matter of “safety,” but it also is unpopular with those who wanted a full repeal of HB2. The new law, which Governor Roy Cooper called “imperfect,” reserves for the state the ability to add protected classes to civil rights legislation (meaning that LGBT people cannot be protected in employment or housing by any city or county), at least until December 2020. It also leaves it up to the state to determine who may use which restroom. Left uncertain is whether this compromise is enough to placate corporate interests and the NCAA. The Atlantic Coast Conference has removed its restrictions on North Carolina hosting championship events, according to Reuters. An analysis by the Associated Press shows that HB2 cost North Carolina an estimated $3.76 billion. Edge Media has the AP story. The bus was given the finger in Philly. 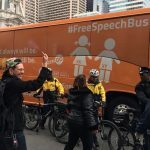 The orange bus with the anti-transgender messages on it — the so-called “free speech bus” — continues its tour of the Eastern United States. The bus failed to show up in New Haven, Connecticut (home of Yale University), although protestors assembled on the Green in anticipation of the arrival of the bus, according to the New Haven Register. The bus did show up in Boston and Cambridge, where students gathered to protest its message, as the Harvard Crimson reports. There is a review of the bus tour so far in The Washington Post. 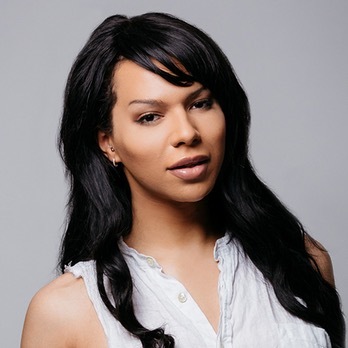 London DJ and trans activist Monroe Bergdorf. With all the fuss over trans people being oppressed it’s nice to take a break now and then a just look at a group of attractive, or just plain hot, trans people who became their true selves and are proud of their bodies. Such a group has participated in a project for International Trans Day of Visibility which happened on March 31. Take a look at the models in GayStarNews. Johns Hopkins University Hospital has lost points in the latest Healthcare Equality Index, published by the Human Rights Campaign, because they have not sufficiently distanced themselves from the anti-transgender writings of Dr. Paul McHugh ad Dr. Lawrence Mayer. The HRC feels that the hospital’s unwillingness to distance itself from the writings of the pair could be an indication of a lack of concern for LGBT patients. This comes shortly after the hospital announced that it would resume gender-correction surgery for the first time in forty years. This story can be found in LGBTQ Nation. If anyone is still bringing up that “study” by Drs. McHugh and Mayer, you can combat them with this article from The Huffington Post. If your opponent says that The Huffington Post is not peer reviewed, you can respond that the New Atlantis is not peer-reviewed, either. The article in The Huffington Post does refer to peer-reviewed journal reports. The Bureau of the Census announced its planned questions for the 2020 U.S. Census, then submitted them to Congress, as required by law. The list submitted to Congress was missing one question that had been announced the day before. The missing question asked if the person being described identified as LGBT. A spokesperson for the Census Bureau admits that the question was withdrawn, but said that it was withdrawn voluntarily, with no pressure from the Trump Administration. Even so, there is little doubt that there was indirect pressure to please the Trump administration. The Washington Blade has this story. This past weekend Transparent won the Outstanding Comedy Series award at the 28th annual GLAAD Media Awards. 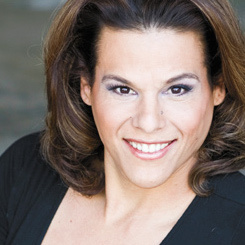 Trans actress Alexandra Billings accepted the award and during her acceptance speech remarked that the trans community and the LGB community as well owe Donald J. Trump thanks for exposing the animosity directed against us. See what else she had to say in the Washington Examiner. A judge in Oregon has approved a name change for Patch Abbatiello as well as a gender designation change to “agender.” The judge in the case, Amy Holmes Hehn, is the same judge who last year allowed a person to change gender to “non-binary.” The Advocate has this story. Jacqui Helbert was a reporter for WUTC, the public radio station owned and operated by the University of Tennessee at Chattanooga. She recently covered the story of a high school’s Gay Straight Alliance visiting various lawmakers, with the intent of talking with them about laws that would affect transgender people. Although she admits that she did not identify herself as a reporter, Ms. Helbert wore her press credentials prominently around her neck, and she carried heavy professional recording equipment including a large microphone she asked lawmakers to speak into. In spite of this, lawmakers say they had “no idea” they were being recorded for a news story. The lawmakers apparently put pressure on the university, which fired Mr. Helbert, despite the fact that the station itself felt she had not committed an offense that justified firing her. This story is in Think Progress. 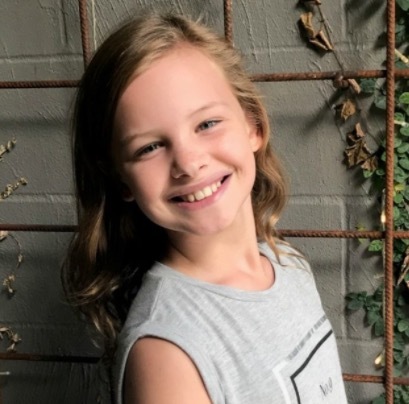 An eleven-year-old girl from Melbourne named Evie became the first transgender person to be a model in the International Kids Fashion Parade. Learn more in The Star Observer. A woman who gave patients unauthorized injections of various non-medical silicone products has been sentenced to ten years in prison. O’Neal Morris was charged with practicing medicine without a license and with involvement in the death of one of her clients. The Palm Beach Post has this story. West Virginia does not have a great reputation for LGBT friendliness, but it is getting better. One can find support groups for transgender teens, if one looks. And even some of the politicians whom you might expect to be unfriendly to transgender issues could surprise you. The PBS Newshour found West Virginia to have growing support for transgender people. Even in places where there is growing support for transgender students, their parents are still scared, and for fairly obvious reason. It seems that some of the worst people are feeling emboldened these days. A ten-year-old transgender student and her parents are profiled in the Post and Courier of Charleston, South Carolina. Proving that it’s never to late to be who you really want to be, we present the story of Patricia Davies. 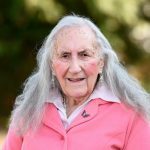 She is a veteran of World War II and she lived as a male for 87 years pretending to be “Peter.” At the age of 90 she came out as trans. Read her story and view a video on The Huffington Post website. Reconstructionist Rabbis have followed the lead of the Reform and Conservative movements by moving for the full inclusion of transgender, gender nonconforming, and non-binary Jews. Orthodox and various ultra-orthodox Jewish traditions have not yet accepted transgender people fully, if at all. This story is in The Times of Israel. TGF Contributor Marc Mitnick sent us more on the Reform movement’s acceptance of trans people, which can be found on the Jewish Telegraphic Agency’s website. The U.K. bank known by the initials HSBC has added several new titles which customers may choose for their bank accounts. Among those are “Mx,” the gender-neutral personal title, “M,” which corresponds to the French title “monseigneur,” “Mre,” which supposedly refers to “mystery,” and “Msr,” a combination of “Ms” and “Mr.” How popular any of the new titles will be remains to be seen, but at least people have options. This story comes from the BBC. The International Day of Trans Visibility has inspired another former contestant from RuPaul’s Drag Race to come out as trans. 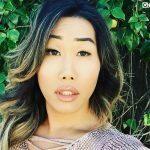 Gia Gunn who competed as a queen in season six of the show revealed herself to the world as a trans woman using her Instagram account. Learn more about her and her decision to transition on the Pink News website. Anglia Ruskin University, in East Anglia, U.K., has a new sign for the restroom. The sign gives advice on what to do if you think someone is in the wrong restroom. It asks people not to stare, challenge or insult people, but to instead respect their privacy and identity. You can read about it in Gay Star News. Vicks has created a new ad for India. In it, a college student talks of how much her adoptive mother has meant for her and how the adoptive mother has changed her life. The adoptive mother is transgender. The heartwarming ad can be found in the Hindustan Times. 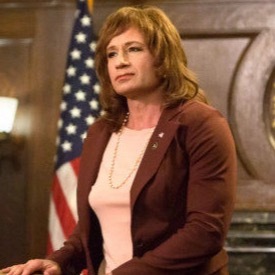 If you were a fan of Twin Peaks back in the 1990s and were perhaps inspired by the appearance of David Duchovny as transvestite DEA Agent Denise Bryson then you will be happy to know that Agent Bryson will be returning to Twin Peaks in the revival of the series this year. Learn more on the Unicorn Booty website. The Japanese beverage company Kirin has announced that it will allow employees to use up to 60 days of accumulated paid vacation time in one block. They cited such causes as taking care of a parent, receiving treatment for infertility, and gender-confirmation surgery. This story is in Japan Times. Back in 2015 the story of a white woman who was presenting herself to the world as a black woman made headlines. Rachel Dolezal was an African American studies professor and the president of an NAACP branch when her parents “outed” her as caucasian. The story sounds strange, even to members of the trans community who find changing gender to be something normal compared to changing your race. Now Dolezal is making news again by saying her “transracial” identity makes her more of a victim of discrimination than transgender people. See what you think after you read her thoughts in The Daily Dot. Within the trans community and in the general public there are many misconceptions about gender reassignment surgery. From seeing GRS as purely cosmetic to the belief that once you have the surgery everything is all set, the myths are looked at and the truth is provided in an article on the Refinery29 website. The Federalist has another in its long series of anti-transgender pieces. In this article, the author (who hides behind a pseudonym) claims to find “10 Ways The Transgender Push Mirrors The Lobotomy Craze”. Neuroscience has found that transgender brains are not the same as the brains of cisgender people, even if those people share the same chromosomes. Yet, this author’s only credentials are that “her teenage daughter formerly identified as transgender, but is now comfortable being female.” Even assuming that statement is true, it is the account of one person, and nothing more. Thousands fit a pattern, but the one who does not fit is the one who is the model for the type the pattern describes? For fighting science with scare tactics, this author gets a TWIT Award. The CBS television program on gender called Gender: The Space Between, hadn’t even premiered yet and right wing conservatives were deriding it as “promoting the radical left’s perverted LGBT agenda.” The program was meant to be a “Transgender 101” course and it told the stories of several trans people. We’re giving a TWIT Award to those on the right who attacked it without viewing it, and because they wish to remain ignorant about the existence of trans people and dismiss us as perverts. Get more on the story from LGBTQ Nation. We’ve mentioned India Willoughby in TWIT a few times over the past few years. She is the British media personality who transitioned from male to female and found a place on the panel of an all-female talk show. Today we mention her for the first time in the TWITs section. It seems Ms. Willoughby feels that crossdressers aren’t trans and should not be using the women’s restroom. What would she have them do? Go into the men’s and get beaten up? For not understanding that trans is an umbrella term, not a “. . .a horrible, vague word. . .” we give Ms. Willoughby a TWIT Award. Read her whole article in Pink News. TWIT is edited and additional material is supplied by Angela Gardner.